HeavenSpirit Creations : happy christmas, 2016! my big craft for christmas gifts this year was bookmarks tailored to the recipient. 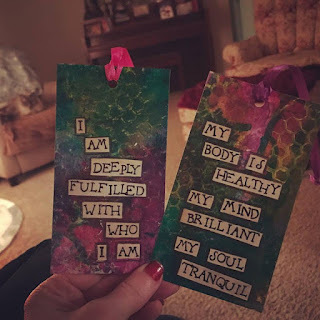 i chose affirmations that i wished my people would know or had more of in their life. i started with sheets of watercolor paper and had fun with inks, acrylics and stamping a texture. lots of layers, as thats how i like my art. i cut them into random sized bookmarks, cause thats how i roll. i don't need no stinking measuring device! organic, baby. took a little time for me to find the look i wanted, but i am pleased with the clean look it created. i added several layers of gloss medium to seal and protect the bookmarks, learning as i went along. my book loving friends and family loved their affirmation bookmarks, and i enjoyed sending them loving energies!